Entrepreneur With Social Impact 2017 Forbes India Leadership Award. Chetna Sinha grew in Mumbai during the time of political activism. As a student, she was drawn towards Jayaprakash Narayan’s brand of socialist politics. During her political activities was when she met her husband Vijay Sinha, an activist farmer from Mhaswad. Sinha had to relocate to Mhaswad which was a life-changing experience for her as well as the people of the village. Sinha saw that the villagers were not provided with basic necessities and thus decided to change things in the village. This also brought about a paradigm shift in her political agenda. At Shetkari Sanghatana, she tried to bring more women into gram panchayats. This was where she learned about the condition of the villagers. 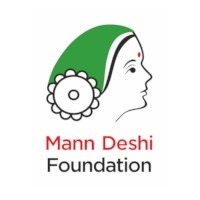 On knowing about the rejection of one of the woman’s request to open a savings bank account, Sinha decided to open a bank and that was the beginning of the Mann Deshi Foundation. Starting a bank was not easy for Sinha. She was taken aback when the RBI had declined her application because of lack of literacy among the members promoting the bank. This was not the end of it. 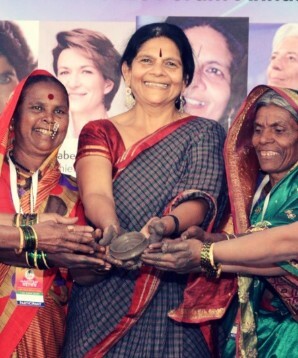 The villagers insisted her to organize literacy classes and in five months, Sinha along with the group of women went back to the RBI with a fresh application. The RBI had approved her application after four months. There was more trouble when she learned that the women were skipping work because they had to trek all their way to the bank. This was when Sinha got the idea of providing banking at the doorstep and started visiting villagers at their homes for transactions. Once, a shepherd walked into Mann Deshi bank to seek a loan for two cellphones—one for herself and the other for her mother-in-law, with whom her Son stayed when she was away. The Mann Deshi staff asked the shepherd if she knew how to operate a cellphone. She said she didn’t and asked in return, “Why don’t you teach me?”Sinha was astonished by her reply and then started a business school at the Mann Deshi Foundation. The foundation has a lot of modules where they not only educate women but also train them in setting up businesses and teach them to scale it up. Sinha through the foundation has always encouraged women to be authoritative and claim one’s rights. Villagers living far away are also not led down, as the foundation has mobile schools on buses that cover up to 40 km from the heart of Mhaswad. In 2014, the foundation set up a chamber of commerce for mentoring aspiring women entrepreneurs. They have set up three such chambers and has a toll-free number to provide instant business solutions. 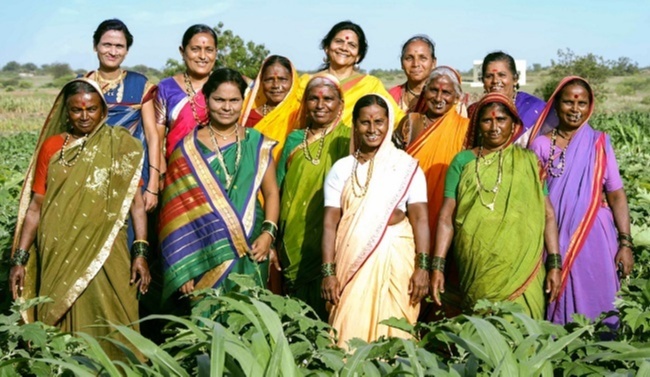 All through her journey with Mann Deshi, Sinha’s focus has been the financial well-being of the rural community. Things changed when Mhaswad faced one of its worst droughts and the villagers had to migrate with their animals. Sinha decided to extend the scope of the bank and organized cattle camps. It was in one of these camps that she learned about the root cause of the crisis and decided to build check dams to hold back water. This ensured water supply to the crops and cattle during the dry months and thus helped the villagers to stay back in the village. Mann Deshi Foundation has also started a sports champion programme after understanding the athletic ability of the people of Mhaswad. Its recent success is the trio Vaishnavi Sawant, Poonam Kalel and Reshma Kewate who were trained for two weeks with the Olympians at the Lake Braddock High School in Virginia. Sarita Bhise is another pride of the foundation who has shown her skills as a national-level hockey player. They also have digital literacy programmes where they introduce rural women to digital banking. It strives women to connect with the larger markets and also makes business payments easier. Most importantly, it gives them a stronger financial identity. Sinha wants to restructure the agricultural marketing system in order to give the farmers the greater bargaining power. Mann Deshi is setting up a cold storage facility for the farmers to save their produce for the next market. This initiative has been taken to minimize wastage for farmers. From Mumbai to Mhaswad, Sinha has come a long way and is still shaping this journey to remember.